This is my superpower: kumimina. Interstitial loving. Cross-caressing. hupasuka msamba. Na watatu? Kumi? gave me unbounded space. And isotropy. it’ll be okay to die. Today, we’re superheroes. of names in classes everywhere. of bodies lined perpendicular to the ground – proud and dead and unspeaking. The reflexive property of equality. God’s grace. Lots of soft edges, and blunt curves. Lakini uhakika si haki. and right and full. Kwa mfano: Mnyamaa kadumbu. They alter nothing. I know these well. Circles, also, are shapes my feet understand. maybe. I’m not sure how to laugh in English yet. That is to say, kila chombo na wimbile. 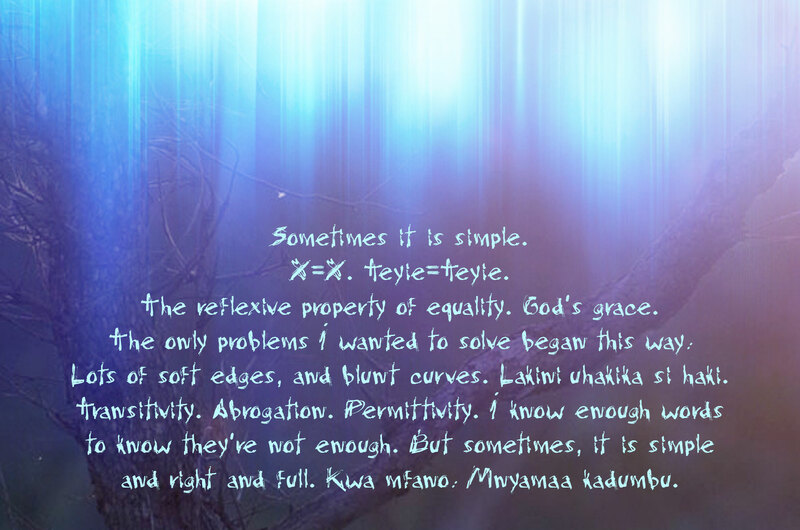 Alexis Teyie (@alexteyie) writes poetry and speculative fiction. She’s an ardent feminist and book-hoarder.